My So Called Life passed another wonderful tag to me. And I'm loving it. Thanks for sharing te Lynn. 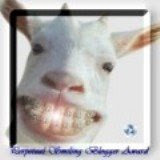 Perpetual Smiling Blogging Award... Do I look cute?! 1. What is your name: Nova - what peps mostly call me! 4. A girl's Name : Nenita - She's my former HS classmate and friend whom I've never seen for a long time. 5. An occupation : Nurse - Easy huh! 6. A color : Neon? - Eww..that's too bright... hahaha not my fave though. 9. Something found in the bathroom : None of I can think of. 14. Something you drink : No letter starts with letter N.. this is hard! 15. A musical group : No Doubt, my fave group! 17. A type of car : NOVA. oh yeah!!! 18. A song title: Nothing's gonna change my love for you. - Just pops out in my head, w/c my friend and brother likes the song. wow! nova care, when man na mugawas sa market sis kay mupalit ko. or basi naa na, wa lang ko nasayud. LOL. thank u for being game sistah. mwahugs!